It is only fitting that Colorado’s campaign to place a wreath on every veteran’s grave should begin on Memorial Day, 2019. Over 160,000 veterans are buried in Colorado’s cemeteries. 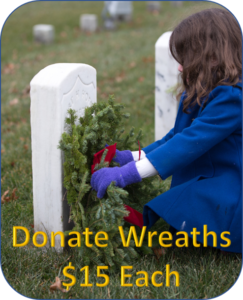 Every handmade $15 wreath is donated by a grateful American, just like you. Wreaths will be placed on December 14, 2019. Ceremony details are listed on this site. Please give what you can and remember that the wreaths you donate will honor the lives of the men and women who protect the country we all love.